Ferrite Memo Magnets for Whiteboard/Office/Fridge. 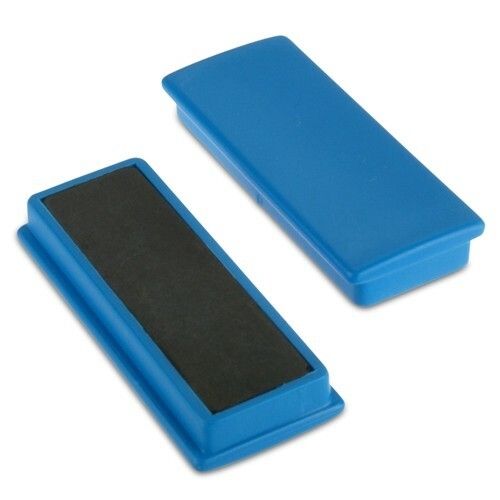 Block plastic coated Ferrite magnet for magnetic whiteboard drywipe boards. Each magnet is housed in a strong plastic cover and has a protective base to prevent marring the surface of your refrigerator or file cabinet. Each magnet has a strong holding force. Our powerful ceramic magnet will hold up to a 12 page report on any steel surface. Each magnet has a convenient write-on / wipe-off surface for labeling. To write on them us a damp erase marker like you would use on an overhead projector, then wipe it off with a damp cloth. Need damp erase markers? We have those too. 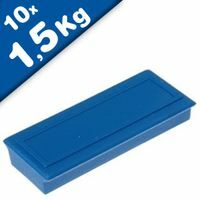 This rectangular magnet is ideal for planning boards. They can also indicate a status on a communication or visualisation board. The magnetic rectangles are large enough to make any status visible from a distance. This magnet is writable over the entire surface. You can also easily erase the written text when using a whiteboard marker. Another use could be as a header on your Visualisation board, by writing on them with a whiteboard marker or by affixing a title sticker on them (label maker / Dymo writer). Our handy and popular office magnets are perfect for the workplace, adhering to any magnetic surface such as filing cabinets, warehouse racking, school blackboards, and ferrous metallic cubicle backings. Also perfect for the home, they can stick to the fridge to display images or important notices. Magnosphere offers a wide and colourful range of whiteboard magnetic pins, made of Ferrite or Rare Earth magnets. They are unusually strong for their size! 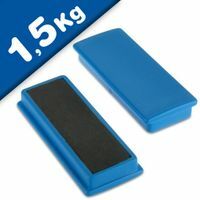 We also provide Magnetic clips in different sizes and colours such as blue, red, white and green that will hold up a bunch of documents as needed. 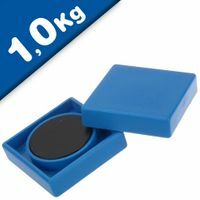 Buy strong magnets for the office online from Magnosphere - Uk's leading supplier of magnetic products. Who supplies high quality Ferrite Memo Magnets? Magnosphere offers best priced Ferrite Memo Magnets globally to all industries, including Automotive, Aerospace, Military, Advertising, Design House, Electronic and Academic/R&D. Please inquire for custom Neodymium magnets or magnetic assembly. Buy Ferrite Memo Magnets at Magnosphere and get a better deal!